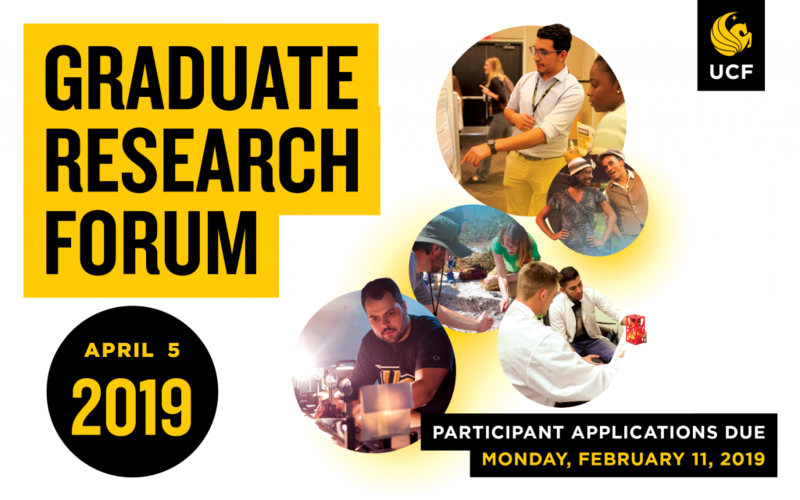 Graduate Research Forum Applications Due by Feb. 11, 2019. Graduate Research Forum is open for submissions! The College of Graduate Studies invites all UCF graduate students to submit your proposals now. Scheduled for Friday, April 5, 2019, in the Student Union, the Graduate Research Forum, a part of Student Research Week is an excellent opportunity for you to showcase your research and creative projects in poster format or an oral presentation while receiving valuable feedback from faculty judges. Scholarship awards are given, and all participants receive university-wide recognition. Current UCF graduate students from all studies and disciplines are encouraged to participate. To submit today all you need is an abstract of 250 words or less, along with your name, contact information, and the title of the presentation. There is no cost for submissions. Proposals must be received by Monday, February 11, 2019. Late submissions will not be accepted. For more information on the Graduate Research Forum and submission guidelines, please visit www.graduate.ucf.edu/ResearchForum or email researchweek@ucf.edu. UCF’s Student Research Week (April 1 -5, 2019) provides opportunities for participants to learn, explore, and engage with the UCF community. Start the week at our kick-off celebration. Attend one of the many free workshops, discussions, and interactive presentations.